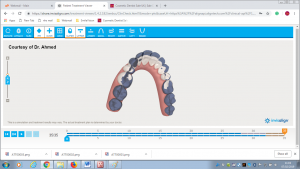 Here’s Part 3 of my Invisalign Journey where I see the results of the Virtual Reality Itero Scanning software so that I can clearly see what my teeth look like now on the big screen (shock, horror!) and step by step how they should look after the full (comprehensive Invisalign® treatment). 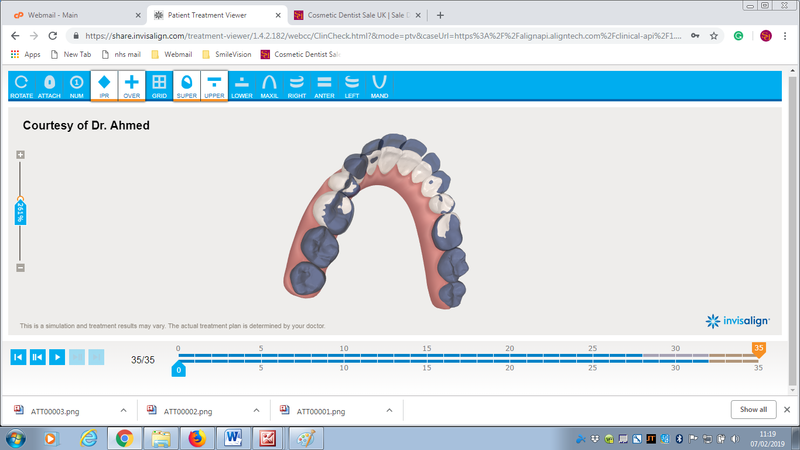 Part of the Invisalign process is you can you see your predicted smile in virtual reality even before you begin your treatment! Amazing! 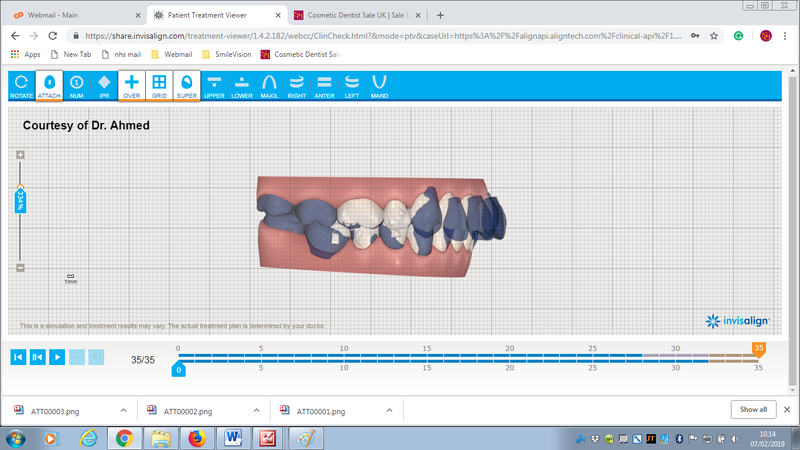 So a week after my Itero scan,which made a full 3D image of my teeth as they are now, Dr Aisha called me back in to look at the results of my ClinCheck® which is the Virtual Reality 3D modelling of my teeth on their straightening journey, from how they look now, to how they will look in the future, after wearing the Invisalign® aligners for 12 months, so that I could see my predicted smile BEFORE I began treatment and could see my future “self”! The ability to see the movements that your teeth will go through, as well as the end result, is what many patients find attractive about Invisalign® and it really got me fired up with excitement and keen to start! Dr Aisha, Principal Dentist, then reviewed my “virtual reality” teeth to check that we were both happy with the prescribed stages and treatment plan. I could clearly see my teeth in 360 degree angles and how each tooth was going to progress over the 12 months and they even moved into my gums to give me a less gummy smile! Once the Dentist has approved this stage then she approves the trays and they are manufactured in real life. 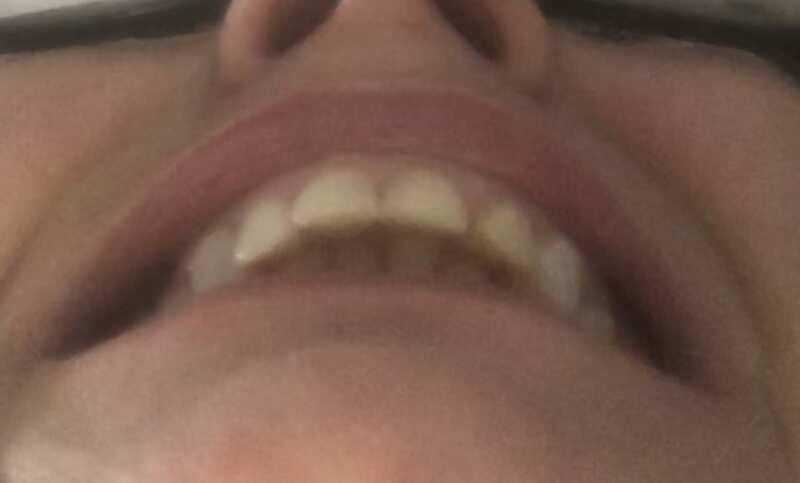 Mandi also sent me an email where I could see my teeth from all angles which was amazing (and horrible) to see as seeing yourself, or just your teeth objectively, is definitely not for the fainthearted! ha I’ve never seen my teeth in 3D before and not everyone can say that their teeth have featured in a 3D animated movie! You can view your own “movie” on your ipad, pc, laptop or mobile and show your friends and family. I was then given an appointment time for two weeks later so that I could begin my smile makeover journey! I am honestly so excited as I’ve wanted my teeth done for a good while now!! I had a number of questions to ask the dentist and Dr Aisha answered them for me at this stage. The sooner I start this treatment, the better! Dentist “You can eat all foods at meal times but you must ensure you clean your teeth thoroughly after eating so that no food debris is lingering in your teeth when you put your aligners back in, but foods such as popcorn, curry and drinks such as tea and coffee are fine as long as you take out your aligners first, clean your teeth after eating and drinking and then place the aligners back in. They need to be in for 20-22 hours per day for them to be effective in straightening your teeth and closing up the gap in your teeth”. Dentist “There may be some discomfort initially as your teeth moving into their new position but if this happens then taking low dose painkillers will ensure you are comfortable again”. 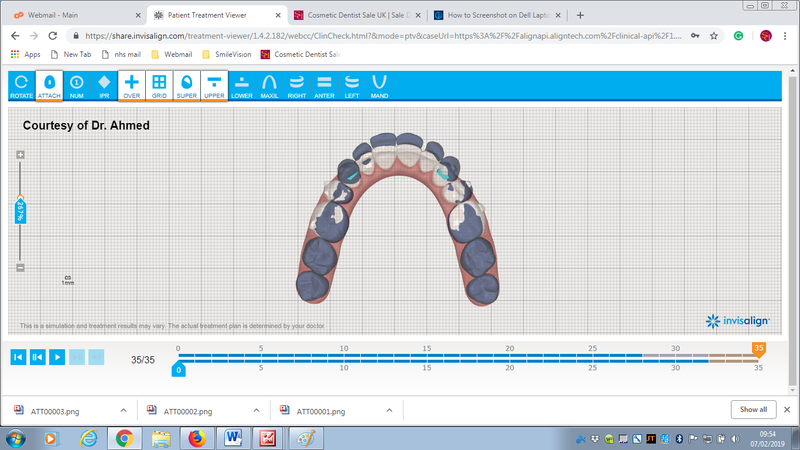 Once the treatment plan has been approved, the Dentist will email you the images of your 3D animated video so that you can see your teeth how they are positioned now and compare them to how they will be positioned during your treatment, by simply clicking on the link and adding your password. The video can be paused to see each step of the journey and you can also view your teeth from many angles. 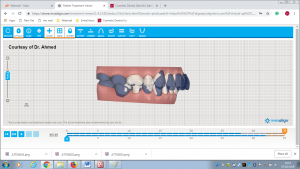 I was amazed to see my teeth in white and play with the buttons to see all the angles I could see my teeth and mouth for example, the lower jaw (or mandible) and the upper mandible (jaw) from the left side, from the right side, from above and from below. I also clicked on the upper jaw and rotated it round. The image was made up of two parts – white teeth and grey teeth. 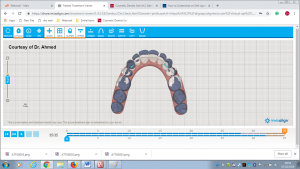 The white teeth imagery shows the position of your teeth as they are moving throughout their Invisalign journey and the grey teeth show your teeth how they start out, by the end of the journey you can see how your teeth have progressed and in my case moved backwards into position. Another brilliant benefit of Invisalign aligners is that they almost “force” you into good dental hygiene! There’s nothing like the feeling of having just brushed your teeth to make you feel all nice and zingy! When you wear the aligners you have to take out your braces before you eat your breakfast, lunch or dinner and then you have to brush your teeth again before putting them in so when having your three meals per day you have to brush your teeth three times a day which is one more time than the breakfast and before bed routine I normally follow. I’ve recently had a flare up in my gums due to having some food debris lodged behind an old crown so am glad that this regime will be in place so that I can keep on top of my oral hygiene and prevent any painful gum pain for at least the next 12 months! Read the next exciting episode soon where I will be actually collecting my aligners for real!